Twenty-sixteen was probably the worst year for online hate speech to date: a year when a loose network of neo-fascist trolls known as the Alt Right finally managed to overwhelm many online discussion platforms in the West, after years of trying. Posing as members of an outraged, but otherwise ordinary public, these trolls flooded Facebook, Twitter, and many major news websites with hateful posts. It seemed clear that they were striving to mould a new popular consensus of contempt for minorities everywhere… and by extension, a consensus of contempt for any social justice movement that stood in their way. And, to a degree, they succeeded in altering the public’s perceptions about everything from the new Star Wars movie, to the Brexit, to Hilary Clinton’s state of health, not to mention the election campaign of President Trump. Maybe it would be more correct to call theirs an ‘unpopular consensus’ though, because no matter what the Alt Right would like us to believe, its extremist hate is still in a minority across the Western world. However, it is easy to forget this fact when its virtual foot soldiers are seizing an ever-increasing range of territory online. How big of a range exactly? One study undertaken by the Anti-Defamation League found that 2.6 million anti-Semitic tweets had been posted to Twitter by just 1,600 individuals in 2016. Together, these anti-Semitic tweets were seen around 10 billion times. This network formed out of websites like 4Chan – an online website, popular with trolls, that also incubated the left-wing hacker collective Anonymous. The Alt Right wields its anonymity like a weapon against its enemies, just like Anonymous does at the other end of the political spectrum. That is where all similarity between the two groups ends, though: they could not be more radically different in terms of their values and aims. Whereas Anonymous openly challenges people in charge, generating debate by exposing the scandals that our authority figures would prefer to have remain suppressed, the Alt Right attempts to do just the opposite. It focuses on blaming, shaming, and intimidation tactics in order to suppress or muddy discussions that could harm its fascist figureheads. Holocaust denial, slamming the Black Lives Matter movement, harassing feminists over Gamergate… you name it, and they’ve smeared it. The Alt Right prefers to take down its targets by stealth, using behind-the-scenes manipulations and deceptions. Typically, its members will create multiple sock puppet (fake) accounts on Twitter, Facebook, YouTube and Disqus from which to post their views. They pose as college kids, single moms, teens, black people, vegans and even Democrats in order to blend in. That way, other Internet users will be slower to identify them as what they really are: facets of a single, homogenous viewpoint. From the kind of targets that they pick, it is easy enough to deduce that their own social group consists almost entirely of a select group of hateful individuals. Yet, in the mainstream media, they deny any connection between that fact and the hate that they preach, claiming instead that it is based on ‘facts’ and ‘research’ that rarely ever seem to see the light of day. Using social media, each right wing nutter magically transforms himself into a one-man lynch mob, liking and reposting all of his own comments from secondary or tertiary sock puppet accounts, chiming in to agree with himself using cut-and-pasted replies. This is how many of the right wing echo chambers in existence today have been created: by a very active, but small, group of right wing users, or even lone ‘keyboard warriors’ acting on their own. Clearly, to the Alt Right, trolling isn’t just a means for getting a message across: it is also a sleight-of-hand trick used to make their views seem more widespread and acceptable than they really are. That illusion of self-righteous, nationalistic fervor only has to last long enough for, say, Britain to leave the EU, for it to be effective. There were, of course, left wing arguments in favour of Brexit. But we should make no mistake about it: getting right-wing parties like UKIP into power was, and is, the Alt Right’s real aim. However subtle and winding their arguments toward this end may be when communicating on more mainstream channels, it is overtly discussed on the network’s key websites. Most of these websites originated in the United States, particularly in the southeast: Info Stormer, Daily Stormer and Breitbart are just three examples. Far-right trolls use these sites anonymously, or pseudonymously, to plan their strategies for attacking the mainstream media and highjacking its ‘message’. It would probably be more accurate to describe the Alt Right as an astroturfing campaign, though – “astroturf” being the term for a protest movement that is engineered to look as if it arose from a ‘grassroots’ of popular public opinion. The Alt Right hopes to advance a brand of neo-fascism across America that has been lurking unseen in the dark recesses of Western national thought for a long time. Trump’s election brought the existence of those recesses to light Stateside, but unfortunately for us, the Alt Right intends to spread the same successes far beyond home shores. 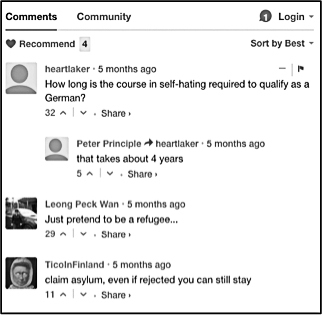 Commenters employing the language of the Alt Right have been increasingly vocal on a number of English language websites across Germany – including those that are read in Berlin – since around 2014. The frequency of bigoted comments appearing on social media and news websites started to increase around the same time that Angela Merkel announced her so-called “open borders” refugee policy. These seem to have been part of a well-planned attack, to counter Obama’s vocal support for the policy. To this day, many of the right wing comments that one sees on Twitter, Facebook and English language websites by Alt Right affiliated accounts have to do with halting migration and issue hysterical warnings about the impending decline of Germany / Europe… always thanks to ‘Merkel’s refugees’. These same comments are rife with American spellings, terminologies, references and slang, suggesting that their authors have little direct contact with European culture. This, despite the fact that they often assume German screen names and use badly-translated German phrases. It’s painfully obvious that the people writing these comments have never set foot on German soil when they describe ravening hoards of dark skinned people rampaging across the country, assaulting women with impunity and setting fire to everything (or everyone) in their path. This sounds more like a scene from an old newsreel of the L.A. riots than anything that has happened in Germany recently. Most Germans would probably see such reports for the propaganda they really are, but such descriptions are not only intended to sway the locals’ views; they also serve the purpose of making Europe’s refugee crisis seem like a crashing failure to Americans reading from overseas. More than anything, these scare stories are a reflection of right-wing fears – largely unrealised – that the President of the United States might try to emulate Merkel’s “open door” policy on home soil. Presumably, that is another reason why the Alt Right campaigned so hard to get Trump elected in the first place. Among the many examples of media outlets which have been flooded by Alt Right trolls is The Local, a Swedish-based online newspaper that publishes news in English for expats across Europe. Since the early 2010’s, its comments section has been gradually overrun by trolls pushing the rhetoric of the Alt Right. One just needs to enter “thelocal.de” + “[address of any white nationalist webpage in the United States]” into a search engine and dozens of articles from The Local pop up, having been reposted in the right-wing backwaters of the Internet. There, an outraged audience re-interprets virtually any liberal move that’s reported on The Local as an assault on the White Race, and typically vows to fight it… by venting their ill-informed rage on The Local itself*. But, as the relative absence of racist, anti-immigrant hysteria in the wake of the Breitscheidplatz truck attack in December has shown, the Alt Right seems to have failed in its quest to sway public opinion in Berlin… for now. That’s not for want or trying, though. What it’s attempting here is an insidious experiment in DIY social engineering, carried out via the Internet and social media. In fact, the above quotes are describing a different group of people entirely. They are taken from a report entitled, “Commissars of the Internet” that was published on La Russophobe, a dissident blog out of Russia, in 2007. The report’s authors describe the way in which several journalists from Russia’s leading progressive publication, the Novaya Gazeta, were harangued and gang-stalked across various online discussion boards by pro-Kremlin trolls. According to the report’s authors, these trolls showed hallmarks of being undercover operatives who were sent in by the government to try and quell signs of anti-authoritarian dissent; hence their name, the ‘brigade’, or ‘brigadniki’ in Russian. A similar, sharp transformation has happened in the comment sections of virtually all English progressive news websites in recent years; The Local is just a microcosm of the overall trend. It may be hard for ordinary Internet users to grasp how simple it can be for a dedicated minority to seize control of an online discussion forum and push it in a more hateful, intolerant direction, just by sheer volume of posts. Yet studies like that done by the Anti Defamation League show just how easy it can really be. One of the Novaya Gazeta journalists who was chronically harassed by the brigadniki trolls was Anna Politkovskaya, an acclaimed humanitarian activist who had documented war crimes committed by the Russian troops in Chechnya. According to the report, these trolls began harassing her in 2002. That harassment only ended in 2006 when an unidentified intruder shot Politkovskaya to death in the entrance to her apartment building. A similar connection between trolling, harassment and murder can be seen among followers of the Alt Right. In a similar case, human rights lawyer and Labour MP Jo Cox was assassinated by British far right activist Thomas Mair just a few days before the Brexit referendum, in June of 2016. 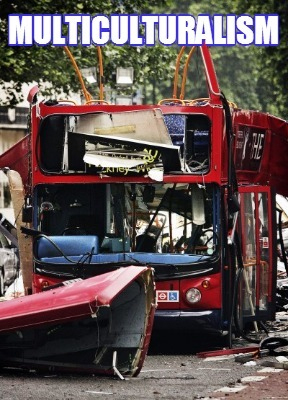 The anti-Brexit campaign memes shared on Daily Stormer included images of the 7/7 terror attacks in London, under the heading of ‘Multiculturalism’. The right wing press has tried to portray Mair as an extremist nutjob (even by their standards, which is really saying something). Yet, he was found sane enough to stand trial, and was duly convicted and sentenced to life imprisonment. One thing that was definitely wrong with him is that he made the mistake of believing everything the Alt Right wrote about the dangers of migration. His case serves as a timely reminder about how dangerous it can be for Internet users to view whatever appears in their newsfeeds with unquestioning belief. The awful truth is that one needn’t actively seek out the Alt Right to be indoctrinated into its beliefs, though; the network makes a point of bringing its ideology to as many people as possible, by infiltrating as many popular websites as it can. This sounds uncannily like the accusation of ‘race traitor’ that is so often flung around by the Alt Right. The Russophobe’s writers also describe how the brigadniki, ‘will threaten their opponents and their opponents’ families with lawsuits, beatings, murder and other reprisals […] for the slightest criticism’. Andrew Anglin of the Daily Stormer seems equally convinced that his murdered opponents have simply gotten what’s coming to them. The week after Jo Cox’s death, he published an article in which he argued that the world was ‘a better place’ without her. But then, he would say that; in a piece called “A Normies Guide to the Alt Right”, he stated that, ‘This is about survival. We must win by any means necessary, or we will cease to exist.’ People who wind up killing others for their beliefs usually embrace that sort of false dichotomy. It is worryingly simple to draw further parallels between the Alt Right and the Russian brigadniki. They share the same taste in the types of fake news stories that they spread about their perceived enemies, in order to drum up hate against them. The EU Disinformation project (https://euvsdisinfo.eu/) regularly lists disproven news reports that are aired on pro-Kremlin news channels, and they are uncannily similar to the types of stories the Alt Right likes to share. Doctored or made-up tales of refugees taking over Europe and committing crimes (especially rapes) also seem to feature largely. Far-right website Breitbart, meanwhile, spun the same statistics the opposite way. “A massive, migrant crime wave is surging across Germany” screamed its headline describing the same report. To back this up, it cited the fact that the overall number of crimes in Germany had risen in 2014; however, it left out the critical detail that such a rise in numbers would have occurred with any rise in population, whether it was driven by new German or foreign arrivals. Therefore, the crime rate had remained unchanged. In their hurry to spread the ‘news’, members of the Alt Right have labelled almost every dark-skinned criminal that they’ve seen on the German news as a refugee, even in the absence of proof. In a well-publicized case last December, a woman was kicked down the stairs at Neukoelln S-Bahn Station in Berlin. Police shared the video with the public in an attempt to generate leads on the attacker’s identity. As it was shared hundreds of times by far-right news feeds, the attacker was variously labelled an ‘asylum-seeker’, ‘Somalian’, ‘Afghan’, ‘Syrian’ or ‘Muslim.’ When he was eventually caught, he turned out to be from Bulgaria. To date, no retraction has ever been made by any member of the Alt Right. This highlights one of the many problems with getting one’s news from social media feeds: the lack of accountability tends to attract people who don’t want the facts to get in the way of a good story. Or at least, their idea of a good story. There is one key difference between the Alt Right and the Russian brigadniki: the trolls who targeted Anna Politkovskaya on the Internet were defending people who were already in power; people who were at the very top of their country’s hierarchy; people who were capable of starting wars, or of hiring hit men to silence opponents, or of shutting down whole websites without a court order (as happened to Crime Russia, another website that is critical of Russian government officials). The voices of the brigadniki represented a privileged minority, albeit one with limitless resources to drown out voices of dissent. Even with all that power, though, a few voices of opposition were too much for them to bear. Nothing but total conformity would do. It never does, with totalitarians. Like the brigadniki, the Alt Right also seems to act as the voice of a privileged minority. That minority used to teeter at the top of the Western world’s social hierarchy – one based on race, gender, class or religion. As the existence of the Alt Right shows, some of its members clearly feel hatred for the progressive forces that have pushed it toward reform. It perceives the prospect of losing its privilege as some sort of existential threat when, in truth, it is nothing more than an inconvenience. Like the brigadniki, the Alt Right’s adherents have a marked tendency to equate the loss of their privileges with the loss of freedom, safety, health, country and life. Critics are called ‘censors’, protestors are treated as a ‘threat to democracy’, even women who just choose not to have kids are guilty of ‘exterminating the white race’. The closer one looks at the Alt Right though, the stronger one’s impression gets that losing privilege is the only threat its members have ever faced. That would fit with the profile of some of the Alt Right’s members, which, according to the Daily Stormer, tend to self-identify as Generation Y, middle class ‘hipster’ males who spend a lot of their time at home. In other words, they are viewing the world from a safe, but presumably dull, isolation. In that vacuum of stillness and silence, the voice of a minority’s hate must resonate louder. Perhaps another adjective that should be added to that self-description, then, is ‘sheltered’. The Alt Right’s reaction to the world’s problems – not to mention its solutions for them – reflects a dangerous kind of naiveté. Its members vastly oversimplify problems by arguing that they are an effect of race, gender or religion. Yet, nothing as superficial as a person’s genetic makeup or culture ever has helped, or ever will help, anyone to tell the good guys from the bad. Perhaps these people have just never faced any threat more immediate than having to sit next to someone of a different colour from them on the bus, or work with a trans person. Perhaps this is why they feel that their preconceptions and pride deserve more protection than actual human rights. But the root of the problem clearly lies in their own perceptions, not in the masses of people they’ve never met, yet still abhor. The Alt Right’s false relativism, which equates loss of privilege with ‘extinction’, underpins all of the other logical fallacies that its philosophy is built upon, like a rotting foundation. 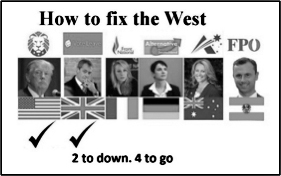 The longer that the media, the politicians and the public continue building their definitions of Western civilization upon that foundation – even if it’s only in some sort of misguided attempt to be inclusive – the greater the fallout will be when it eventually cracks. We only need to look at Russia, where the brigadniki have escalated online harassment and persecution to murder, to see what might happen when it does.